You’ve been searching all day. You’ve traveled hundreds of miles, sometimes backtracking to make sure you haven’t missed anything. Some areas are so infested with hostile creatures that you’ve been prevented from continuing on your journey until the creatures were destroyed. After all that, you’ve finally … finally, found what you’ve been looking for – the secret passage that transports you to another place. You’ve moved up to the next level! You’re so excited that you barely notice how much your back hurts, nor do you notice that you’re on the verge of getting a migraine headache… again. It may sound like a strange story, but it’s all too familiar for gamers or their loved ones. Especially when that person’s use of games has become excessive in duration. Using games like this as a form of escapism is fine. But some find their hobby turn into a habit, and then an addiction. Whether they play on an Xbox or online, they enter worlds filled with witches, elves, dragons, and more, by traveling to mysterious and sometimes secret locations. They spend so much time in this other world, they begin to do physical damage to their bodies. Carpal tunnel syndrome has long been associated with computer use, so it’s no surprise that it’s a physical symptom of gaming addiction. Carpal tunnel syndrome is caused when the main nerve between the forearm and hand is squeezed or pressed. This occurs when the carpal tunnel – the area of the wrist that houses the main nerve and tendons – becomes irritated or swollen. Overuse of a computer mouse can cause such irritation and swelling, as can excessive use of a video game controller. Migraine headaches typically start in one spot and slowly spread, getting more painful as they progress. In severe cases, the pain can be so extreme that it causes the sufferer to vomit. Light and noise can cause excruciating pain. Someone who plays video games for extended periods of time is more prone to migraines because of the intense concentration required and the strain put on the eyes. The term “sleep disturbances” covers several sleep-related disorders, including insomnia, narcolepsy, sleep apnea, nocturnal myoclonus (periodic leg or arms jerks during sleep), and parasomnia (i.e., night terrors, sleepwalking or talking, and nightmares). Sleep disturbances are caused, in part, by overstimulation of the brain. However, some people can’t get a good night’s sleep simply because they think obsessively about the game they’re playing. In some cases, the individual will even play through the night to the detriment of their performance at work or school the following day. Backaches are a common physical symptom of gaming addiction because most gamers stay seated in the same position for hours on end. The lack of movement causes stiffness and soreness, but could deteriorate into chronic back problems. Eating irregularities are caused by gaming addiction simply because most addicted gamers don’t want to take the time to eat properly. Rather than eating healthy, balanced meals, they eat food that is quick and usually unhealthy. In extreme cases, the gamer may choose not to eat at all. An addicted gamer is not going to take the time to properly care for themselves. Showers, face-washing, and brushing hair and teeth all get put on the back burner. It simply becomes less of a priority, if it’s a priority at all. These physical consequences will occur in varying degrees from one gamer to another. Though the severity of physical consequences is often tied to the severity of the addiction, this is not always the case. A gamer that is already in poor physical condition will be more susceptible to these effects early on. In most cases the simplest solution to these adverse effects is to stop or radically reduce the time you spend gaming. A trained therapist is a good person to turn too for help in finding strategies that’ll make this possible. However, loved ones and families shouldn’t expect a quick fix. Breaking behavioral addictions can be a long and arduous process and your love and sensitivity will be crucial in helping your friend or family member overcome their difficulties. If only it was as easy as putting down the controller and not picking it up again! Frequent gaming has been associated with brain changes related to increased dopamine release. The positive reinforcing effects of gaming make instant progress difficult to accomplish. 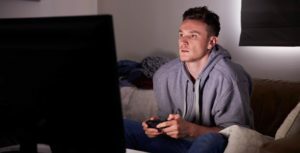 Also, many addicted gamers use the alternate reality offered by video games to escape from underlying issues associated with depression, anxiety, or ADHD. Treating mental health problems takes time and patience in all cases. Indeed, video games may act as an escape initially but over time they often actually exacerbate mental health issues. Finally, its important to listen to your body and seek professional help when confronted with physical health issues. Don’t immediately rush back into an intensive workout program if you’ve been largely sedentary for months or years. Instead, look for assistance starting a graded exercise therapy regimen. Physical therapy might also help if you suffer from ongoing aches and pains related to a lifestyle that revolved around excessive gaming.